Written in 1926, Morphine is a short story that’s part of a collection known as “A Country Doctor’s Notebook”, which though not his most prominent work (the Master and Margarita claims this title), serves as a prime example of Bulgakov’s gripping narration and fantastic characterisation. Upon reading this story, I felt that in order to comprehend the text, we must examine the two protagonists, who stand in stark contrast to each other when juxtaposed, alongside the main themes and issues raised in the text. As such, he’s the text’s main hero. Displaying many virtues, he portrays the ideals that we expect in a physician. Passionate, hardworking, diligent. We can see his passion for the art of medicine on several occasions. He admires the town hospital as if it were the most magnificent building he’s seen, exclaiming: “Oh, what a splendid thing a large hospital is, with its smooth, well oiled-machinery!” He’s also very eager to read up medical texts and fill gaps in his knowledge, as seen in his mental notes to “read up some psychiatry” and his musings about “the mechanism of sleep”. We must ask ourselves- does he maybe feel that his proficiency as a doctor is fading? It’s possible, that with all of the Hospital’s superb facilities and increased opportunities for recreation and socialising, Bomgard’s vision of himself as a multi skilled doctor is fading. Therefore, with all of his attempts to block Gorelovo out of his memory, he keeps revisiting the countryside in his mind before sleep, “fragments of recollection passing through his fading consciousness” . “Moscow.. a clinic.. asphalt, the bright lights” . We must ask- of what value is publishing the diary to Bomgard, other than highlighting his strength as a physician against Polyakov’s weakness? It cannot act as a discouraging agent as such, since it wasn’t through his own fault that Polyakov became addicted to morphine. And it cannot help overcome the isolation that country doctors feel- rural people still need doctors. Hence, the diary that documents Polyakov’s personal demise, the diary that was entrusted to him, was exploited by Bomgard. It shows, that as a physician, Bomgard overcame the struggle of Gorelovo- he had the strength and determination to. Publishing the diary highlighted Polyakov’s inability to do so, although both physicians had the same starting point. The act of publishing the diary serves to show us a clear divide in physicians’ qualities as doctors and as people- though Bomgard may be a superb clinician, unfortunately, he’s not the most admirable person. His infatuation with Anna Kirillovna, who later becomes his mistress, is also quite fascinating. We must ask ourselves, whether or not the feelings are genuine. As it stands, she’s the only person who currently feeds his addiction. He relies on her to make up his morphine solutions, to revive him upon his cocaine overdose, and to be the external support that he needs. His stint with cocaine is also quite interesting. It’s an attempt to replace morphine, to beat his addiction. Now that his psychological wound has healed, he doesn’t need morphine as an antidepressant anymore, but rather, he needs it because he has become addicted. He’s fully aware of this condition, and is plagued by a sense of shame that stems from it. He becomes paranoid, afraid that “other people may find out about [his] vice”. The main fear associated with this would be losing his doctor’s licence. This highlights the fact that Polyakov still sees his personal and professional lives as two different entities- his addiction shouldn’t have an impact on his role as a doctor, although, he’s grateful for his location in his “isolated practice”. It’s precisely the perfect medical setting that allows a doctor to indulge in his personal vices, such as a morphine addiction. We do feel quite frustrated at Polyakov’s futile attempts to beat addiction. He convinces himself that he can indeed beat it, and that with proper help and treatment he’ll overcome his struggle, but reality begs to differ. He uses the revolution as a pretence to indulge in his addiction, and turns to both lies and theft in order to gain access to the drug. “tear that page out” when referring to more shameful episodes of theft. He never does this, which leads us to assume that although he does have brief moments of lucidity, his life is now prevalently chaotic, insane, and fluctuating between euphoria and living hell. He deteriorates both physically and mentally. He now hallucinates even when sober, and grows physically thin and weary. He vomits frequently, his body is covered in abscesses and ulcers. He has become a doctor with no regard for sterility, the crystals of morphine are what he now sees as “life giving”. Bulgakov’s skill as a writer shines through, in the way we can see the diary entries becoming shorter and more abbreviated, as was stated earlier on in the story by Dr. Bomgard. Bulgakov hints at the fact that Polyakov’s suicide may be a pre-meditated act, as he tells Anna that he’ll “leave here by February”. His diary entries become increasingly shorter, his thoughts increasingly more sporadic and staccato. The thought of staying alive becomes unbearable, and after intending the notebook for Bomgard, Polyakov kills himself by gunshot, having previously stated that he has no fear of rifles after the Muscovite revolution. Ultimately, his addiction won. Whatever the doctorly qualities Polyakov was trying to hang onto were, his personal vices overcame his professional virtues. The most prevalent theme was addiction, however, I believe that because it’s so confined to the character of Polyakov, examining the character offers more insight than examining the theme specifically does. Therefore, I believe that a much more valuable issue to consider is isolation within medicine. It’s undoubted, that rural areas do require their medics, it’s a simple fact of life. But we must ask- what kind of doctor should work there? As evident, Bomgard hated the rural lifestyle. He couldn’t wait to get out of Gorelovo. 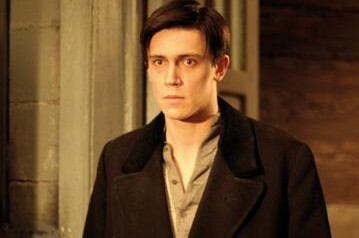 Polyakov on the other side, embraced the isolation, but for all the wrong reasons. The seclusion of a rural landscape allowed him to wallow in his own depression, and was evidently a very unhealthy environment. Therefore, I wonder- is there a type of doctor who’s ideally suited to a life of isolation and disease? Although the era of the story is different, we must still remember, that essentially, medicine is about people serving other people. It’s about interacting with live human beings to the closest extent. Hence, is it even probable, that there even is a type of doctor who would voluntarily give up stimulating social interactions and go work in an area such as Gorelovo? Image-wise, my absolute favourite image in the story was when Bomgard describes Polyakov’s death. He says “greyish violet shadows, like the shadows cast at sunset, showed more and more clear in the hollows around his nostrils, and a fine sweat, like droplets of mercury, was forming in the shadows.” It’s an image that combines the natural world with the human form and with death. The image highlights how death is a process that awaits all of us, and how although it may seem alien and terrifying, it’s a natural progression that follows life. The slipping of Polyakov from this world may indeed be described as a dark shadow at the end of a sunset. 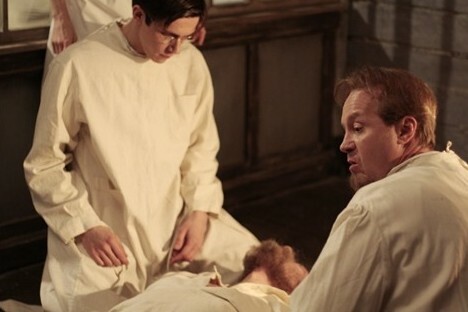 On Tuesday 23rd of this month at 8.15pm, as part of the Dublin Film Festival there’s a screening at the Light House cinema of Aleskey Balabanov’s take on Bulgakov’s Notes of a Young Doctor. It sounds very gruesome (“Sick-bags at the ready” is how the blurb opens), but if any of you are interested in going, let me know and I’ll book a bunch of tickets so we can go as a group.